Beck, who was convicted of sexually and physically abusing more than 100 children, ran children's homes in Leicestershire. He was given five life prison sentences and died in jail. Greville Janner was Labour MP for Leicester North West and then Leicester West. Leicestershire Police have submitted a file to the CPS and have been taking advice on moving the investigation forward. Detectives executed a search warrant at a property in Barnet, north London, in December. The Cambridge graduate stood down as an MP in 1997 and was subsequently made a life peer. 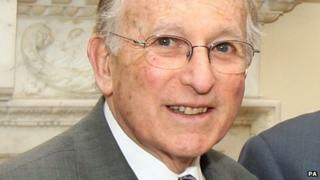 Lord Janner, a father of three, is a former president of the Board of Deputies of British Jews. He is also chairman of the Holocaust Education Trust.